When the news came out this bar turned away a PTSD service dog, they were actually within the law. They won in court. But then, something stunning happened. They did the right thing and held training for other business owners to learn the law and what these fabulous service dogs do! GRAND RAPIDS, MICH. - The Holiday Bar in Grand Rapids hosted a service dog training session for local business owners Saturday. "We thought they might be interested in hosting us because of what happened, and they were," said Jenn Gavin, owner and head trainer at A Pleasant Dog in Grand Rapids. The bar and restaurant refused to serve veteran Jerome Smith, and his service dog, JoJo, on Friday, Nov. 10. The Holiday Bar manager said they were kicked out to keep JoJo safe, but apologized for "disrespectful and unprofessional" actions. The business then donated more than $2,000 to the Grand Rapids Home for Veterans. Gavin, along with local attorney Nicholas Vander Veen, spoke to a small crowd about what business owners can and cannot do when people come into their establishments with service dogs. "You can ask two questions: is that a service dog trained to mitigate your disability?" Gavin said. "What is it trained to do? You can't ask for certification. You can't ask why it's not wearing a vest." On Jan. 4, a Kent County prosecutor said The Holiday Bar manager would not be charged because JoJo was not wearing a leash when the incident occurred. 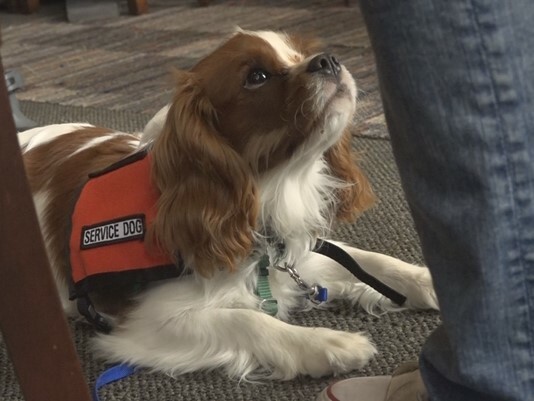 According to the Americans with Disabilities Act, service animals must be "harnessed, leashed or tethered, unless these devices interfere with the service animal's work or the individual's disability prevents using these devices."